Glass is present everywhere. In our house we use glass in the form of mirror, windows, jars etc. It is also present in modern technology equipment from electric bulb to computer screen. But we never really pay attention to it since we take it for granted. How it is manufactured? Where the basic element comes from? How it is recycled? Let’s us try to answer some of these questions and talk about the amazing recycling facts. The basic element used for making glass is silica sand. When silica sand starts melting, something that happens at very high temperatures, it is combined with other minerals giving rise to a new material called glass. Glass becomes solid at room temperature and it is viscous at high temperature. At high temperature the sticky glass and minerals mixture is poured in the mold, pressed and blown into a shape. Depending upon its cooling rate glasses are categorized and used for different purposes ranging from packaging to optical fibers. Why are glass made containers preferred over polymer products? Usually medicines, wines, beers are stored in glass bottles. Manufacturers of such products do not use polymer bottles for storing their products because glass is chemically inert and we can shape them a lot easier according to manufacturer requirement. Adding to glass advantages is its ability to be recycled. Glass recycling process is very simple. It is a fact that glass obtained after recycling is not low in quality compared with new glass regardless of how many times it gets recycled! The first step with every recycling process is of course collection, where haulers collect glasses from consumers. Consumers place the waste glass in special designated bins or haulers collect glasses from them through the various curbside programs. Collected glass comes in various colors and thus they have to be separate with the use of a cullet processor because they are chemically incompativle. After this first stage of processing some glass is directly send to the market for sale. Most worn out, green and brown color glasses are collected separately and are prepped for recycling. Contaminants are removed in the next step and glasses are separated by means of their color and size. Separated glasses kept in their respective furnace at high temperature glass melts and become sticky. The viscous material is then poured in molds and kept at room temperature to become glass after cooling. Quality of the glass is maintained even though it recycled endlessly. According to the survey taken in 2009, most of the glass products used in households have been recycled. Recycling process takes place quickly and the glasses are placed in the store shelf within 30 days after they are collected by the haulers. Recycling glasses is an environmentally friendly process and it saves the atmosphere from pollutants caused by glass waste. 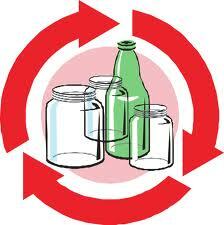 Recycling can save energy which is used for making new glass. For example if one glass bottle undergoes recycling this results into a saving of about 100 watts. In 2013 50 percent of the glass which we use will be recycled one. Large amount of carbon dioxide is released from manufacturing new glass .This can be avoided by using cullet in manufacturing new glass. Most of the consumers trust that the products packed in glass bottles or jars are of good quality. This makes the manufacturer to recycle glass bottles and stuff their product into it. In all countries there is a bank to collect the bottle .In USA there is around 50,000 banks to collect glass bottles. Each bottle bank has a capacity to withstand around 3,000 glass bottles. After that it will be emptied, collected glasses will send to recycling.